This company's latest 2017 generation of a satcom controller has proven to be favorably received, much like the previous generation released in 1997 that has totaled four figure sales. 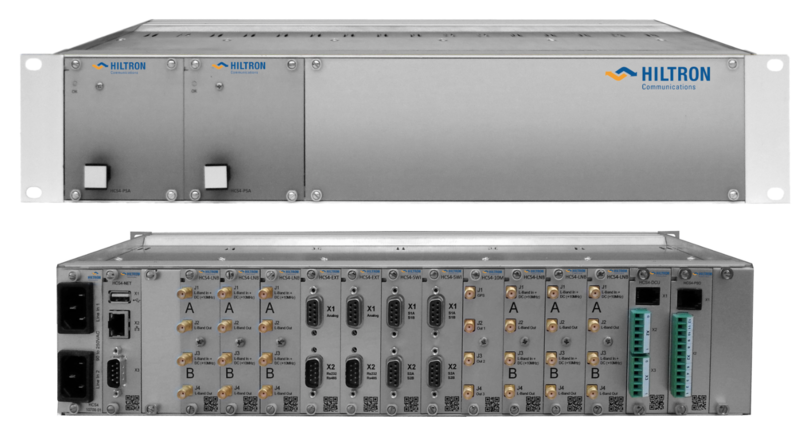 Hiltron Communications, a European satellite equipment manufacturer and system integrator, reports strong demand for its latest-generation HCS-4 satellite communications controller. More than 70 units have been sold for antenna control applications since the HCS-4 was introduced in September 2015. An additional 10 customized systems incorporating the HCS-4 have been delivered since July 2017. These images show front and rear of the 2U high 19-inch rack-mounting Hiltron HCS-4 satellite communications controller. Designed and produced by Hiltron, the HCS-4 was developed from its HCS3 predecessor which was introduced to the satellite broadcast and communications market in 1997. Following the positive characteristics of the HCS-3, the HCS-4 forms the central control element for a wide range of satcom applications. These include easy switchover between devices such as downconverters, high power amplifiers, waveguides, MPEG digital video broadcast encoders and integrated receiver/decoders. The HCS-4 can also be used to control and monitor optical-fiber transceivers and antenna heaters. The HCS-4 is available as a 2U high 19-inch rack mount unit with main and backup power supplies plus 13 slots for active modules. Also available are two chassis mountable frames accommodating up to six, or up to 14 active modules respectively. All three versions can be powered from 24 volts DC and are operated via an intuitive HTML-based graphic interface. Modules are hot-pluggable to allow easy exchange. Any new or replaced module is automatically sensed and its address registered. All units in the family have SNMP remote control, hot-swappable dual redundant power supply and an internal data bus. When configured as an antenna controller, the HCS-4 accommodates a freely selectable combination of axis controller cards for SSI-encoders, resolvers or potentiometer-angle readers as well as an optional integrated antenna de-icing controller card. HCS4-10M 10 MHz reference source. This allows signal distribution to a switchable internal bus and three external outputs individually switchable between off/0/9 dB. It has a very low noise and highly stable internal VCXO plus an internal GPS receiver and can be synchronized with GPS or station clock. HCS4-DBT Dual Base T for LNBs and BUCs with variable supply voltage for LNB/BUC, individually switchable 10 MHz insertion (0/9 dBm), RF level detection. L-Band switch units (HCS4-SW), a transfer switch version (HCS4-LST) and a 2:1 redundant-switch version (HCS4-L21). HCS4-EXT controller module for equipment monitoring and control. De-icing controller with two main heater circuits up to 20 A each and an independent feed heater circuit (24 or 230 V) plus current, voltage and temperature monitoring. HCS4-PD2 compact dual channel power detector, up to 18 GHz. HSACUX-DIM2 ultra-compact combination of GPS receiver, flux gate compass and dual-plane high-precision inclinometer (58 x 64 x 36 mm), fully weatherproof.